Australia concerns lead to holding-back case study on Great Barrier Reef, so Union of Concerned Scientists posts it independently. Climate impacts seen posing risks to sites . . . and to tourism. Sometimes, too often in fact, it’s not what’s included in the text of a report that captures the attention. It’s what’s omitted from that report, often not mistakenly. That’s a lesson learned and re-learned in the public policy field, but apparently not really absorbed in many cases. Those who internalized the lessons from the early-70s Watergate scandal that led to President Nixon’s resignation know well that it’s the cover-up, more so than the initial offense, that is the real crime. Only slightly more recently, the original “Jaws” in 1975 taught a similar lesson, as the fictional Amity Island town council sought to silence the truth in an effort to protect its tourism financial interests. 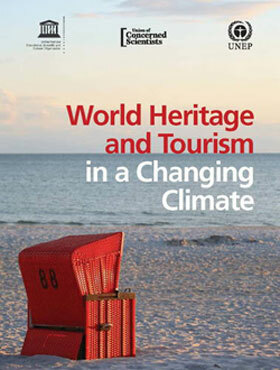 Advance now to a new report, “World Heritage and Tourism in a Changing Climate,” released May 26 by two United Nations agencies and the Union of Concerned Scientists, UCS. In a somewhat dual-personality report that at times seems as concerned tourism as with impacts of climate change, the report paints a dire image of 31 natural and cultural World Heritage sites in 29 countries around the world. Around the world, that is, save for Australia and its, ahem, rather important Great Barrier Reef (GBR), by any practical measure a worthy entry among top-ranking heritage and tourism sites. And clearly one with observed and serious impacts from rising ocean temperatures, increased acidification, and continuing carbon dioxide emissions. The third leg of this three-legged co-authorship stool, UCS, seemingly didn’t get the memo. UCS posted the would-be Great Barrier Reef chapter on its website, thereby establishing itself as the adult in the room. The whole tawdry affair resulted, of course, in giving the GBR case study even more worldwide visibility than it otherwise would have had as one of a series of case studies. First reports of that mischievous omission broke May 26 in the Guardian. Australian tourism and development lecturer Allison Anderson of Central Queensland University quickly followed up at The Conversation. The U.N./UCS report points to “unequivocal scientific evidence” that the changing climate “is fast becoming one of the most significant risks for World Heritage sites worldwide” (including in Australia). In Yellowstone National Park, for instance, the report points to a 1.17 degree C increase (just over 1.8 degrees F) in temperature in the Rocky Mountain states since 1985, most of it coming in the last few decades. Springs and summers are expected to grow warmer still in coming decades, with average temperatures warming by 4 to 5.6 degrees F by 2100. The outlook for Yellowstone calls for shorter winter seasons and less snowfall and snow, and more days with above-freezing temperatures. The report cites “a steep decline” in snow from 1961 to 2012. The earlier snowmelts are altering timing of peak stream flows which, combined with higher temperatures, lead to less and warmer water for rivers, resulting in a 26 percent decrease in native cutthroat trout. Briefly addressing Mesa Verde National Park in Colorado, the report says its roughly 4,500 archaeological sites “are under severe threat of irreversible damage both from the increasing wildfires and from the flash floods and erosion that often follow.” It points to risks of more park closures and to tourism by the half-million annual visitors who contribute about $47 million to the local economy. The report concludes with a set of recommendations to policy makers and site management authorities. It suggests, among other things, that sites be identified based in part on their vulnerability to climate change and regularly monitored; that “inadequate resourcing” of sites for climate adaptation be a focus of attention; that “detailed” climate adaptation and tourism management strategies be developed; and that risk-reduction and disaster response and preparedness strategies be put in place. The full “World Heritage” report is online here. The would-be Great Barrier Reef case study is online here.